Amid pressure from the U.S. to pick sides and growing concerns about Chinese infiltration into strategic sectors of its economy, the EU is taking a long, hard look at its relations with Beijing. A joint communique of EU leaders later this week may pave the way for an overhaul of merger rules, allowing European companies to get bigger, and thus better positioned to face Chinese competition. Some member states are also seeking to revive stalled public procurement legislation making access to tenders in Europe conditional on reciprocity. The discussion between EU foreign ministers and their Chinese counterpart today may be unusually interesting. 5G Contracts | One big thorn in Sino-European relations is allegations of state-sponsored cyber-espionage. Germany is poised to auction for the airwaves to build ultra-fast 5G wireless networks this week, amid U.S. warnings to ban the use of Chinese equipment for security reasons. In what could be a first, tame step in this direction, EU governments will issue a joint statement this week making cyber-security a factor in 5G procurement. Brexit Threat | Theresa May is working to win support for her divorce agreement but she won’t put it to another vote in Parliament on Tuesday unless there is a strong chance it will be approved. May hopes that the fear of a long extension to the scheduled withdrawal date and the prospect of holding elections in the U.K. for the EU Parliament in May will push skeptics over the line. The Dutch premier thinks it all looks like a Monty Python sketch. Populists Humbled | Reports of liberalism’s demise have been greatly exaggerated, at least in Slovakia, where a pro-European, female lawyer secured a landslide victory in the first round of the presidential election, trouncing her populist opponent. Zuzana Caputova, propelled to victory by voter anger over corruption, will now face European Commission Vice President Maros Sefcovic in the runoff on March 30. Google Fine | Google is set to receive a third EU antitrust fine on Wednesday for its AdSense advertising service, ending the final, formal EU probe of the company. The search giant is also trying to fend off future cases with changes to how it shows rival search results to satisfy EU concerns over local and jobs searches. The tweaks seek to address criticism over how Google is complying with a 2017 antitrust order to give equal treatment to rivals. More Laundry | We may have just scratched the surface of the money-laundering scandal engulfing Europe’s financial system. After Danske Bank, authorities in Denmark are taking a closer look at companies that provide payment services, while the Bank of Italy asked ING Groep to avoid any business with new clients in the country after it fell short in recent anti-money laundering checks. German Merger | It’s official. After months of speculation, Deutsche Bank and Commerzbank announced the start of exploratory merger talks. Combining the two would mark a historic deal creating Europe’s fourth-largest lender by assets — and follows years of failed attempts to boost revenue and cut costs. The German government, with a 15.6 percent stake in Commerzbank, may remain a shareholder in the combined entity, people familiar with the talks said. French Comrades | Capitalism fuels inequality, destroys the planet and is ineffective at delivering goals in the public interest. Nope, it’s not a quote from the Communist Manifesto — it’s France’s warning message to the world’s advanced economies, as Paris uses its presidency of the Group of Seven to argue that the system needs to be reinvented before it tears them apart. Catalan Separatists | Thousands of secessionists marched in downtown Madrid to protest a trial of their leaders, in the biggest show of Catalan strength in the capital since the separation movement began gaining traction in 2012. The trial of 12 Catalan leaders for their role in a botched independence proclamation in 2017 is a central issue in the national election set for April 28, held against the backdrop of a political crisis that’s helped topple two Spanish governments in less than a year. Half a decade has passed since Vladimir Putin annexed Ukraine’s Crimean peninsula. For Russia, the costs continue to mount. 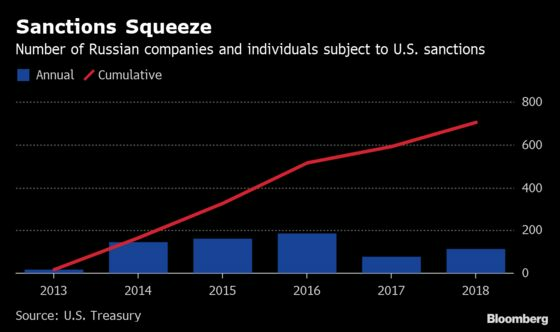 The country and its residents — already suffering from low prices for oil, Russia’s main export — are feeling the pain from a drop in foreign investment and stagnating incomes. A recent survey suggests public support for the annexation is starting to wear off. 12 p.m. EU Council President Donald Tusk meets German Chancellor Angela Merkel in Berlin; Tusk then meets French President Emmanuel Macron in Paris at 4:15 p.m.